A big thank you to all my customers for your patronage, and for your patience with me while I'm participating in art shows all over the country. I try my best to get orders out, and update my website, but it has been difficult with such a busy schedule (I also work 4 days per week, and have 2 very active kids!). I now have a gallery in Amana, IA, but cannot be there much due to my show schedule. I hope to be open for Maifest (May 4-6th, 2018), Oktoberfest (October 5-7, 2018), and for the month of December, 2018. It is located at 4313 220th Trail (Main Street), in Amana. The building is on the north side of Main Street, just as you are coming from the 4-way intersection. The entrance is on the east side of the Painted Cupboard Antique shop. I am from Amana, Iowa, so most of my pictures are shot from that area (mostly driving to work each day at the University of Iowa). Prints are of highest fine art quality, using archival inks and papers. I feature an art form I have developed over the past two years, "Archival Art Boxes". The boxes are fine art prints, mounted on wood panel boxes, made with state-of-art archival materials. They have been a hit! They work well for collages--hanging several together with a common color or theme. I have been fortunate enough to participate in some of the finest art shows in the country. My work has been chosen for several large commercial projects, and exhibits, and publications. I have won many awards (on display at my gallery). I thank God for giving me the talent to pursue my art, and my family for supporting me, especially that crazy, old, white-haired lady you may see me with at shows, my mom! Hope to see you at a show! See my schedule below! Sept 1-3: Watch for update! Sept 7-9: Watch for update! Sept 15-16: Watch for update! Oct 5-7: Oktoberfest in Amana. Gallery will be open! Feb 24-26: Iowa State Fairgrounds, CLEARANCE SALE! August 12: Amana Arts Festival--Held on Main Street in Amana this year! 40th Anniversary! 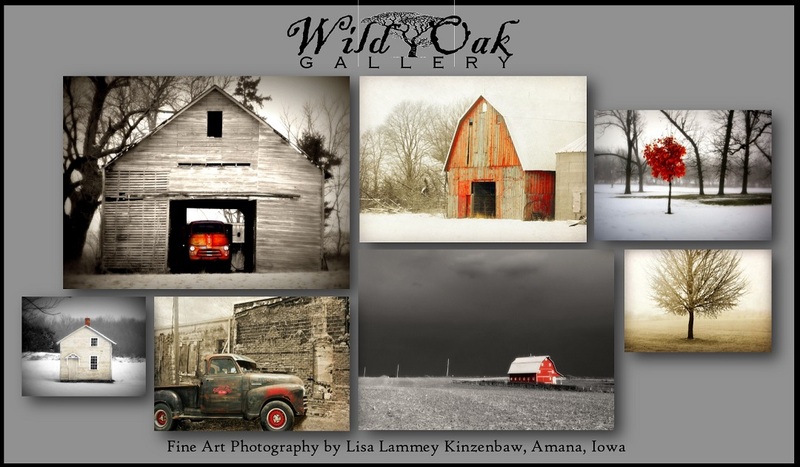 Sept 29-31: HOPE TO HAVE GALLERY OPEN IN AMANA FOR OKTOBERFEST! Feb 26-28: Iowa State Fairgrounds, clearance sale! March 12-13: Council Bluffs, Mid-America Center, clearance sale! Feb 27-28: Iowa State Fairgrounds, Clearance Sale! March 21-22: Council Bluffs, Mid-America Center, Clearance Sale! Signed Print, mounted in Photo Grey Mat, foam core backing--Frame Ready! (great for do-it-yourself framers).